Photo: Janet Coit, DEM Director; Steve Medeiros, RISAA president/camp director; and camp participants held a cast-off to open the third annual RISAA Youth Fishing Camp. This summer was a big success for Rhode Island Saltwater Anglers Association (RISAA) youth programs, such as Take-a-Kid Fishing Day, which exposes youth to fishing for the first time, Youth Fishing Camp, which nurtures a child’s desire to fish, and scholarship programs that encourage college-bound high schoolers to seek fisheries or environmental-related studies. Over the years these programs have taught youth the joy of fishing, how to be responsible stewards of fish and habitat, and the importance of strong conservation measures in fisheries laws and regulations to ensure we have fish to catch and eat in the future. Now that summer has ended, here is the scoop on three of the organization’s youth programs. 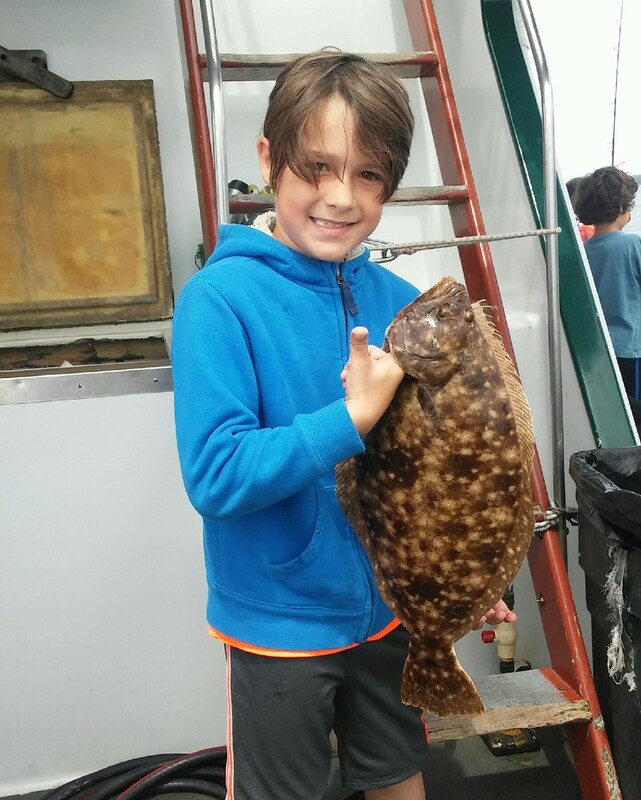 Noah Blasi of Warwick with the 22” summer flounder (fluke) he caught at the RI Saltwater Anglers Association fishing camp. 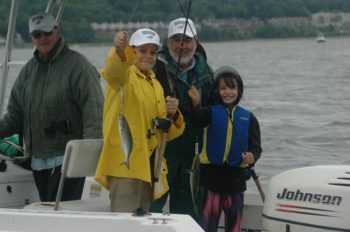 “Double hook up,” “Fish on at Sally Rock,” “The bluefish are going for anything small and shiny.” This was the sound of a successful fishing trip as I listened to the marine radio during the Take-a-Kid Fishing Day held this spring in Greenwich Bay, RI. The aim of the program is to give children a chance to learn about Narragansett Bay and the environment, experience the thrill of catching a fish and ride on a boat in saltwater. Eighty-one children, 41 volunteer vessels and about 150 volunteers served as mates, logistics volunteers, cooks, servers and cleaners. Some years the number of participants totals over 200, but the threat of inclement weather kept some youth organizations from participating this year. The children were treated to hot dogs and hamburgers, which capped off a very successful day on the water. Click here for a video on Take-a-Kid Fishing Day. The third annual RISAA Fishing Camp was a big hit with participants this summer. Noah Blasi (age 10) of Warwick, RI said, “The fish was a little hard to reel in, but it was not the first fluke I’ve caught.” Noah was talking about the 22″ fluke he caught when fishing on the Seven B’s Party Boat out of Pt. Judith during the second day of camp. Fifty-three children attended the three day camp with 35 RISAA volunteers and Department of Environmental Management staff members working to make it a success. On the first day campers learned fishing gear and tackle basics, fish identification, how to use spinning and conventional reels, casting and fishing from shore, knot tying, boating safety and how to tag and release fish. The second day was a trip on the Seven B’s party boat and the third day was cancelled due to thunderstorms. Click here for a video on RISAA’s 2018 Fishing Camp. Ed Cook at the helm and mate Pete O’Biso, both long time RISAA volunteers, provided a great time for youngsters fishing on their boat during this year’s Take-a-Kid Fishing Day on Greenwich Bay. RISAA awarded its final scholarship last month from four youth scholarship programs for last year high school and first year college students. Additionally, there are member scholarships that are awarded to any good-standing members of RISAA or their immediate family, specifically their children or stepchildren, grandchildren, brother or sister, or stepbrother or stepsister who is currently in their high school senior year. For more information about youth programs or other RISSA programs, visit www.risaa.org or email president Steve Medeiros at stevem@rissa.org. 2018 RISAA Youth Fishing Camp participants, volunteers and staff. Captain Dave Monti has been fishing and shell fishing for over 40 years. He holds a captain’s master license and a charter fishing license. He is a vice president of the RI Saltwater Anglers Association, an active member of the RI Party & Charter Boat Association and a member of the RI Marine Fisheries Council.